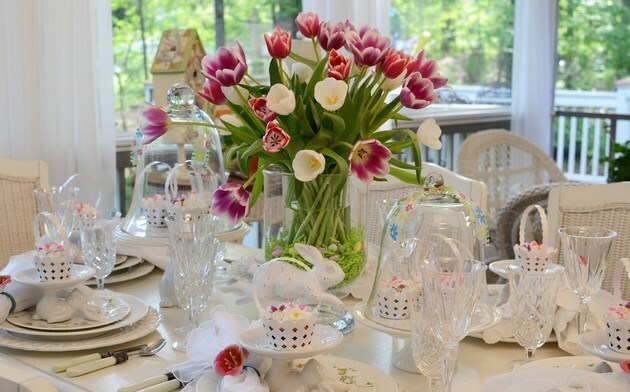 Easter bonnets, painted eggs, flowers in springtime colors-how couldn’t Easter be one of my favorite Holidays for tabletop décor?! White goes with everything so it’s a wonderful pallette to mix with accents of springtime tones!! 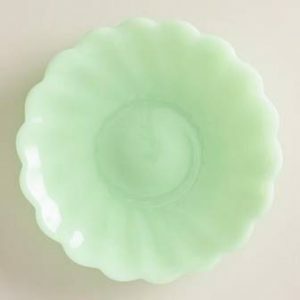 A little trick of mine is to use my white dishes and let the salad plates set the tone of the table. 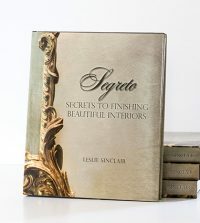 They are much less expensive, easier to store and come in so many wonderful colors and designs. 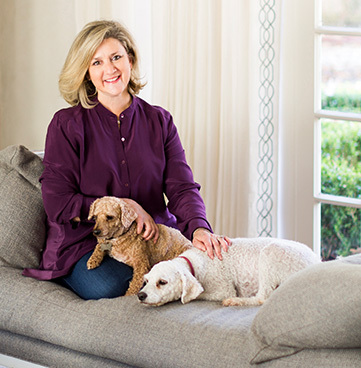 Searching the web here are a few of my favorite picks for this Holiday season!! 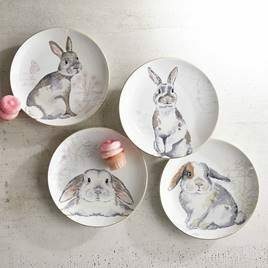 Here are some other plates from World Market that would put you in the springtime mood – not so holiday specific these could be used throughout the year. Sold in a set of six are on sale for $35.94! 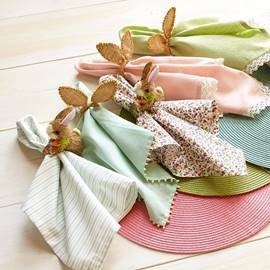 Now for the napkins – whether you use plain white or colored napkins it is always fun to accessorize them with fun napkins rings. Pier 1 always has some great affordable holiday table add-ons. These napkin rings are $4.95 each! Both cute, my favorites are the burlap bunny ears!!! 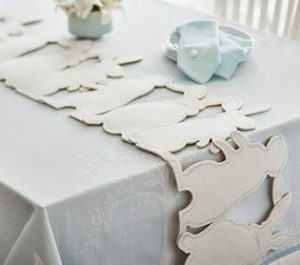 And this super fun felt bunny table runner is on sale at Pottery Barn Kids for $31.15. A great way to personalize it is to paint a family member’s name on each bunny! Each year add any new additions! An Easter time family tree!! The flower arrangement can be super easy! Just grab a lot of the same flowers, put them in a vase, and they will showcase on their own. Tulips? Lilies? TIP: Trader Joe’s gets a new shipment of fresh flowers every day at 8:00 am! I will make my floral decision the Saturday before Easter Sunday. Pottery Barn has the cutest tablescape inspiration photos this year showing all of their holiday wears!! I kind of honed in on there birds nest for sale 4 for $20. This is one item I can just buy, however I am inspired to a paint eggs this year to use in my décor. 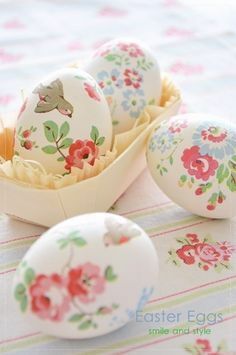 An Easter egg craft day with family and friends would be super fun. 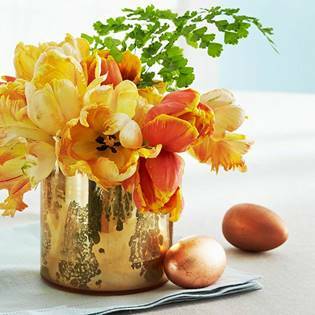 You can make eggs metallic with paint of gold and silver leaf, embellish them with sequins or simply dye them in your favorite Easter colors. This would be my pick-and combined with my grandmothers blush vintage glasses, my table would be spectacular. 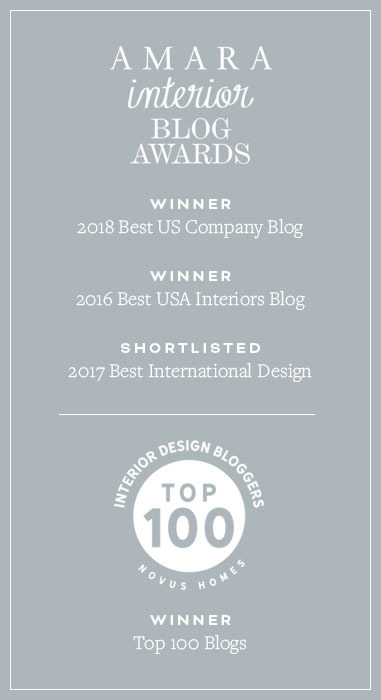 But… when I started adding it all up for a place setting for 12 the total for 12 Pier 1 plates, chargers and napkin rings and a Pottery Barn runner was $258. To add the birds nests would be another $60. While that is not bad, I decided to see what I already had first. 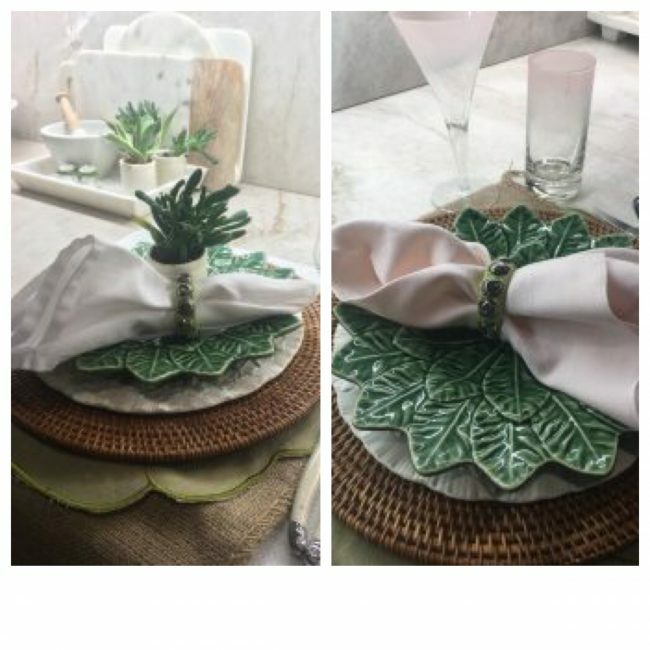 I have a lot of layering pieces which could go Easter- the burlap, the leaf placematt, rattan charges and certainly the cabbage plates. If I just added some color or orange to the mix with different napkin rings I thought I could create something with little expense. 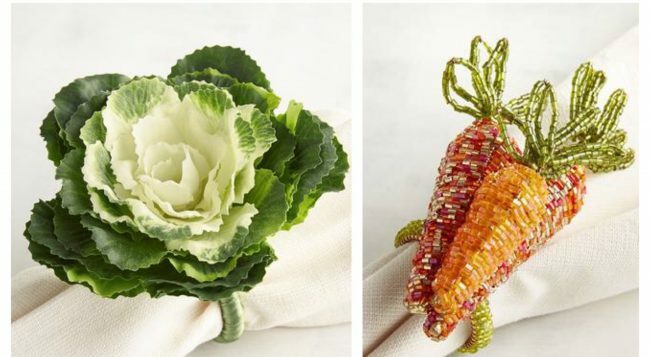 Adding the cabbage or the beaded carrots napkin rings would be perfect. All from Pier 1 I could even combine these with the burlap bunny ears!!! How fun would this table look incorporating a floral arrangement with carrots lining the glass vase? This would cost about $50. Right in my budget. I was off to pick up my Mom for a shopping trip. UGGGGH, they were sold out of my favorite picks, so Mom and I got a little side tracked! 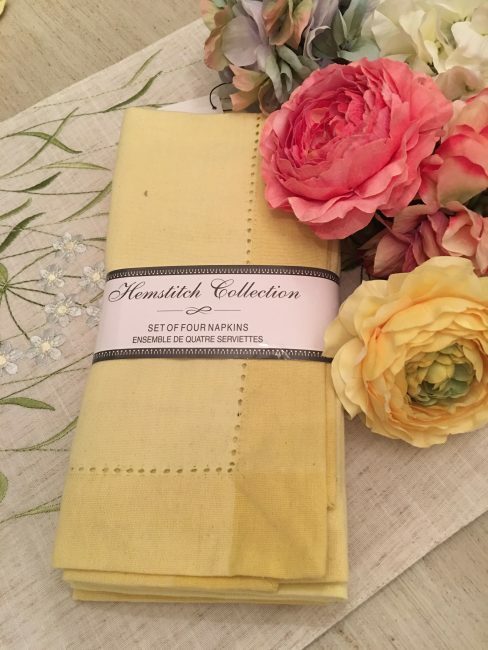 We saw these flower napkin rings and opted for a true spring time table! I felt like I could use these for Mother’s Day or a lady’s brunch. There is a Marshall’s next door to Pier 1 so we stopped in and purchased the runner and napkins there. I am missing the bunny theme a bit but I do think the new purchases go well what what I have. Did I save money? 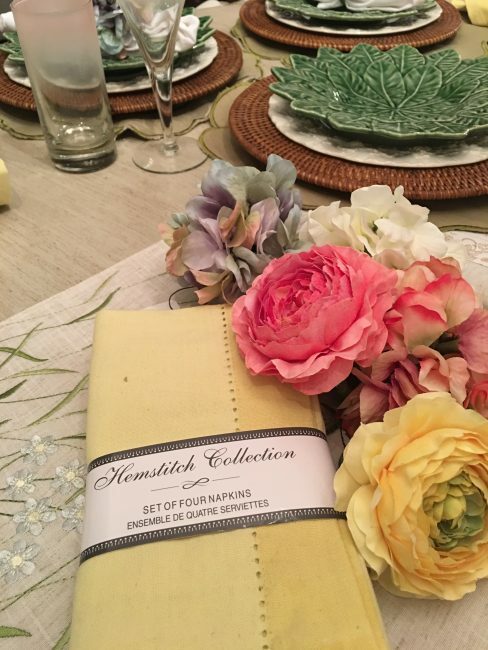 I purchased the 12 napkins, napkin rings and runner for $75! 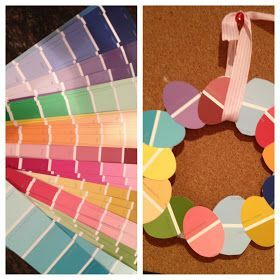 And for my easy breezy Easter egg craft day……………. 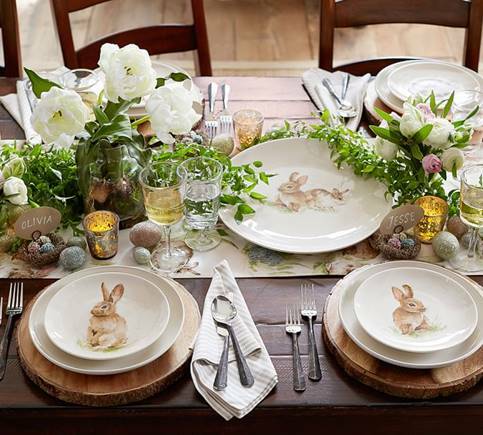 I thought this concept was so pretty, would add some Easter to my tabletop! These are made using paper napkins!! You could buy wooden eggs at Michael’s for .99 so they will last for years. 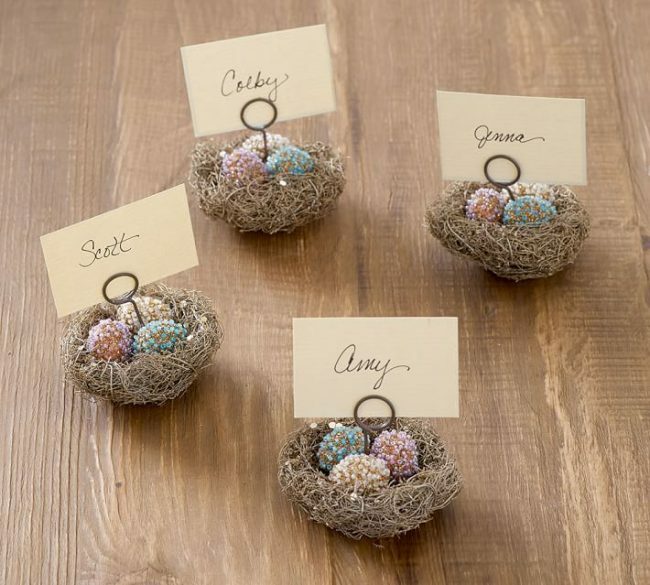 Here is the link on how to make these super cute eggs! And best part I will spend time with my Mom, aunt and girls doing something fun! 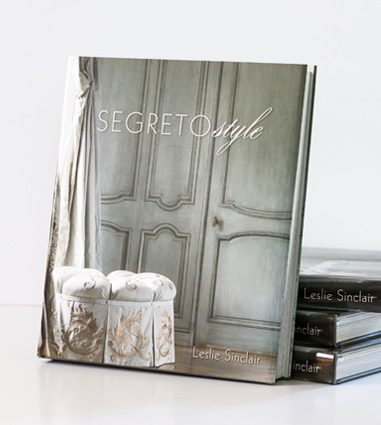 A great idea I will have to make–We certainly have the supplies here at Segreto! 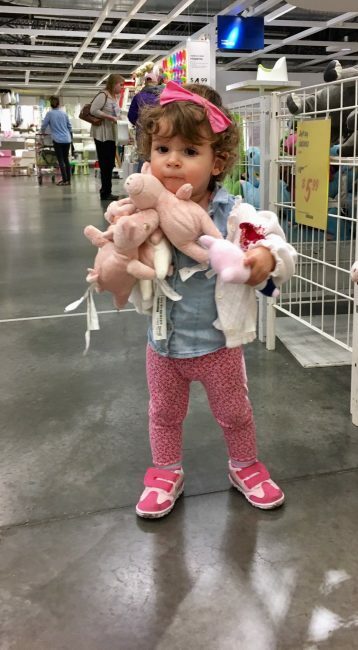 Adorable Charlotte, my surrogate grandchild, is already excited about her Easter Décor!! She is really my operations mangers Isai’s little one, but she is so cute and happy all the time I just want to adopt her!! I hope you all have a blessed Easter with your family and friends and give thanks for what this special day is all about. 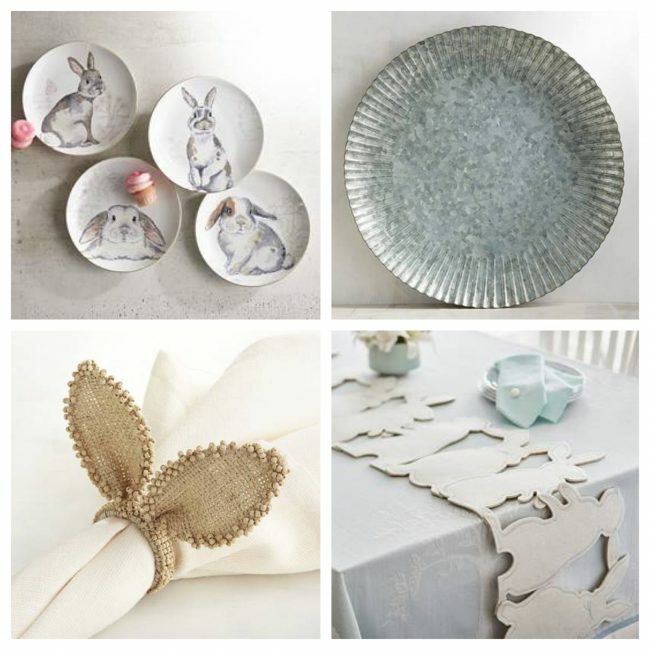 Send me your Easter tabletop!!! I would love to use it on next year’s tabletop Easter challenge. 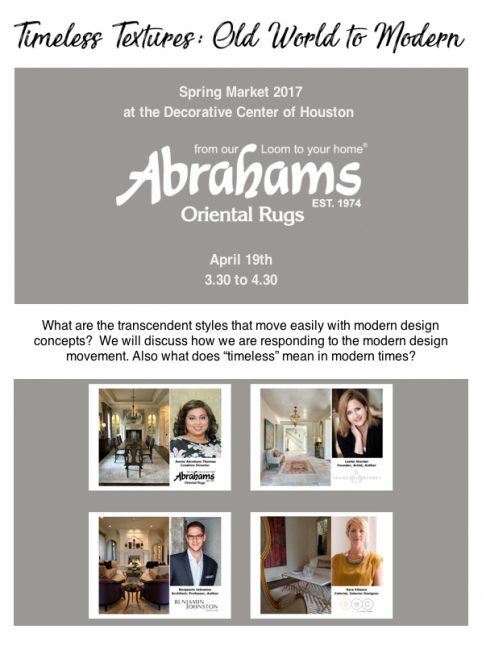 If you are in Houston, I am excited to be included on a panel discussion at the decorative center!! Should be fun!!! 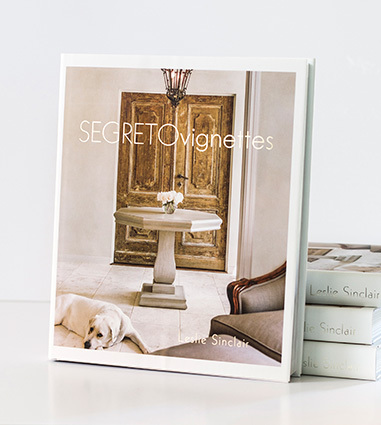 << A Wonderful Home With Segreto's Finishes for Sale!!! I have been looking forward to this post. I agree with your dream Easter table picks. Are the chargers at Pier 1 also? Thanks. They are on sale it looks like too! Happy Easter!! !